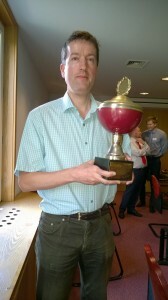 The 2014-2015 club championship, played again as a 9-round rapid tournament under the organisation of tournament director Jesper Abrahamsen, was again a great success, attracting 35 players. It ended with a convincing victory of Tom Wiley. Having lost the title in 2014 just in a play-off against Georgi Tomov, Tom won back the trophy with a fabulous score of 8/9, being the only player to stay unbeaten in the championship. One full point behind Pere Moles Palleja finished 2nd, losing only to Tom and Georgi. Tim Binham came 3rd with 6.5 points, followed by 4 players with 6 points: Frank Hoffmeister, Christophe Keller, defending champion Georgi Tomov and Martin Müller, who started with 1/4, but recovered in style with 5 wins in a row. Even though they are not in the Top Ten, special mention should be made of some players that clearly performed higher than their rating, e.g. Luis Busquets (5/9, including draws against Tom and Tim! ), Vladimir Dedobbeleer (4.5/9), who started with two wins against stronger players, and Ventsislav Petrov (4.5/9).